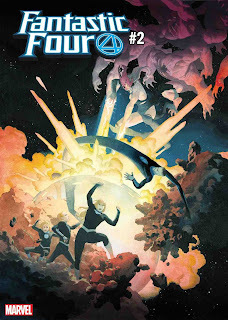 I'm very happy to see the Fantastic Four back on the stands where they belong! But I have to admit... as much as I wish otherwise... I'm not really enjoying the opening story, which must deal with explaining the reason why Reed, Sue and the extended family have been missing from the Marvel Universe for a while. The explanation for why the family has been missing is just way too much to accept (their "pastime" feels like something you'd read in a Silver Age DC comic - it's all fantasy and no science fiction). And then they encounter a menace that stumps Reed. And Valerie! And the solution is... well, out of character. I want to love this comic! (The art is certainly lovely.) But so far, my reaction is just... Eh.